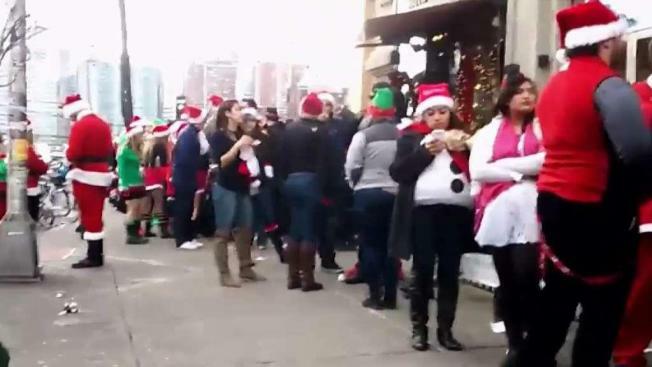 Seventeen people were arrested, including a woman who allegedly punched an officer in the face, at Hoboken’s SantaCon on Saturday, according to the city’s police chief, who was providing real-time updates of the police response on Twitter. “The @HobokenPD HQ has 9 prisoners in it now from the first 5 hrs of SantaCon,” Chief Ken Ferrante tweeted shortly after 4 p.m. A couple of hours later he announced a 10th arrest for disorderly conduct. He said there were more arrests this year than in a quarter of the time last year. Just had a prisoner spit directly in one of our @HobokenPD officer's face during processing. Correspondents from @FiOS1NewsNJ saw the conduct of that individual & his 2 friends outside of HQ while interviewing me. They are seeing 1st hand what we are dealing with. Report at 10pm. In all, police issued 51 summonses for drinking in the street, public urination and disorderly conduct, he tweeted on Sunday. He said officers also issued 32 summonses to drivers. The tweets followed a stream of others by Ferrante. He said dozens of extra officers were patrolling the streets to look for unruly people taking part in the annual event, which sees hundreds dressed as Santa hopping from bar to bar. 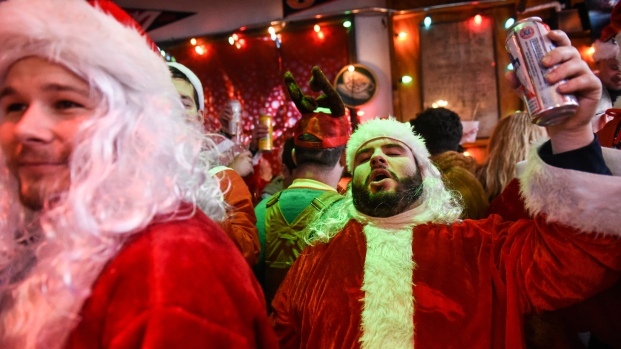 Like other SantaCons, the bar crawl has come under fire for the rowdy behavior of some of its merrymakers. NJ Transit prohibited all beverages on its trains and buses Saturday and part of Sunday ahead of the event. “The @HobokenPD officers out on the streets will do their best to keep these revelers under control, and when these Santas break the law, they will be there to summons or arrest them,” Ferrante wrote earlier in the day. There was a large fight at a bar on Washington Street resulting in three arrests for assault, and ambulances were being dispatched to pizzerias and diners to take drunk people to hospitals for detox, according to Ferrante, who said some nearby bars were over-occupancy by hundreds of people. Most notably, one woman involved in a fight was arrested after she punched a responding officer in the face, Ferrante said, adding that she would face a charge of aggravated assault. Ferrante said no officers sustained injuries that needed medical treatment.